Entering the library, I walk over to the circulation desk and get into line. As I am waiting, I fish my chequebook out of my purse. In a rather ungainly maneuver, I hold the checkbook in one hand and scribble out a barely legible cheque with the other. A conversation about overdue books. As such, I am only peripherally aware of the conversation going on at the desk, which seems to center on a fellow and the return an overdue book. After I finish the cheque, I have nothing better to do, so I tune into the conversation in front of me. The librarian is offering this fellow the option of paying now or at a more convenient time. As he pulls out his wallet, I hear expressed surprise that someone could leave without paying his or her overdue fees. The librarian explains how the system lets users run up a bill of $25 in fines before it suspends checkout privileges. The fellow hands the librarian some money. As he waits for her to make change, he loudly announces that he can’t imagine how anyone could possibly run up that much in fines. Hearing this, I give a start and glance around guiltily. I discreetly close the chequebook on the cheque I’ve just written for $35. The fellow is done and turning to go. As he moves off, I step up to the counter and struggle mightily to control my impulse to kick the fellow in the shin, as passes me. I am always running up huge fees at the library. With the number of books we check out there is bound to be one or two that we mislay in the house causing them to be overdue. I just consider it my way of helping the library purchase new books. Seriously, with all the fees I’ve paid they should dedicate a whole wing to me. The mystery of the lost library book. 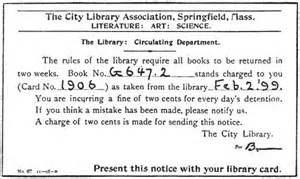 This last huge bill occurred because of a lost book. I distinctly remember my daughter expressing interest in the book. I checked it out for her. She didn’t read it, but, apparently, another kid thought it looked interesting. So that kid took the book. She didn’t find it interesting at all, so she did the only logical thing she discarded the book on their bedroom floor. This is where the book languished. Slowly fading into obscurity, the enormous pile of laundry, miscellany and ephemera or, as it’s more accurately know, the floor, in the bedroom of my teenage daughters. Yes, the book was absorbed into the Sargasso Sea that lies upon the floor of that room. Every time I checked my list of outstanding books, this book showed up. So I went looking for it to no avail. As its dues date approached, I begged the kids to look for it. In a monumental example of gas lighting, all the kids insisted that they never saw that book. According to them, we never checked out this particular book. In fact, according to them this book never existed. Yet, there it sat on my card slowly, gathering overdue fees until it was deemed permanently lost. At this point, I paid the full price of the book. Six months after the book vanished, the girls cleaned their room for the first time in eight months. Coincidentally, they found the book they never had. Cue gasps of amazement; vindicated was I, although one kid did claim a frame-up. How the lost library book was eventually found. It doesn’t matter. We are now the proud owners of this book. I paid for the book and due to the time the book was overdue, the library has zero interest in its return. It bought a new book with the fee. So there you have it. That’s okay, I’ll just add this new book to my library; right there next to the amphibian book that we acquired in much the same way. Again, that book entered some mysterious Bermuda book triangle we have in the house and reappeared again several months after we’d paid for it. We only found the amphibian book because we were moving. It was under our entertainment center. I have no idea how it got there unless the cats dragged it back there to do a little light reading.